Trends may come and go, but there's an old standby gift that's always welcome any time — drinking gifts. 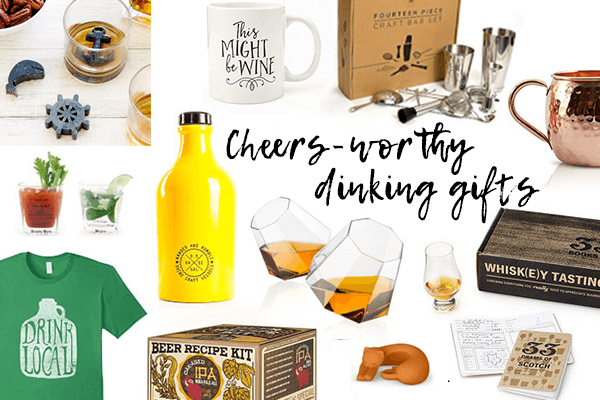 Even better, gifts for drinkers have become rather trendy with the ever-increasing popularity of homemade craft brews, wine tours, and even playing mixologist at home. So what do you give your favorite boozehound? We’re serving up a long list of gift ideas for drinkers — from top-tier finds to bottom shelf winners. Beer makes an awesome gift the host of almost any event - from summer barbeques and housewarming soirees to game nights and other gatherings. Not to mention, beer gifts are an easy way to toast big milestones (like landing that promotion). With small-batch booze, drink accessories, and many ways to stock a home bar, it's easy to feel stuck on what beer-themed gift to give. Here are our best tips on beer gifting minus the brouhaha. Find out whether they're an IPA type, more of a lager lover, love a kitschy label or like to brew their own; knowing this will help you find a gift that lines up with their tastes. Beer gifts don't have to directly relate to the serving and drinking of those foamy suds. There are loads of beer-themed decor pieces that acknowledge their love of brew when they may not even be imbibing. This is a safe bet if you don't know what kind of beer they like! Your host can always use another bottle opener; especially ones with a super rad or polished and personalized design. Beer has come a long way from the humble beer can. From growlers to a fancy six-pack caddy, there are many fine gifts that help to kick back with a brew in style. Look for personalized gifts that deliver a message of congratulations right on the box, bottle or label. Or, to celebrate a milestone, give them as many bottles of their favorite beer as years they've been at whatever you're celebrating. Give the gift of sampling artisanal beers with a monthly club membership. You can add on set of mugs or matching glasses to make it even more fun.